Southampton City Clock Tower ( 12 ). The big bell ‘christened’ officially by the Mayor-Mrs Irene Candy & Mrs Mary Johnston on May 11th. 1985. Named ‘Solent Chimes’ After a public survey by the Southern Daily Echo. 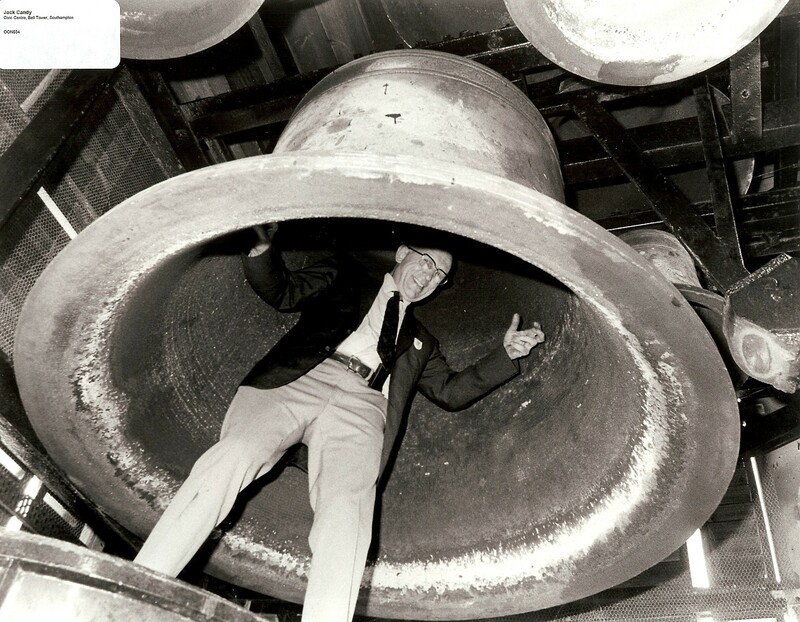 Mrs Johnston was the widow of the bell’s founder, Cyril Johnston, OBE of Gillett & Johnston,Ltd., the Company which supplied the bells & clock mechanism. The main bell three & half tons. A stainless steel plaque was unveiled in the bell chamber. The Bitterne Brigade’s Band played the Isaac Watts hymn – ‘O God our help in ages past.’ The tower is 163 feet high. The ‘Echo’ arranged the public ‘Bell Naming’ arrangements. PS. The Council has arranged for public visits up the tower from 2010.